This morning, I flew from Boston to New York. Before that, I woke up in a hotel, trusting everyone on the staff who has a master key. I took a Boston taxi to the airport, trusting not just the taxi driver, but everyone else on the road. At Boston's Logan Airport, I had to trust everyone who worked for the airline, everyone who worked at the airport, and the thousands of other passengers. I also had to trust everyone who came in contact with the food I bought and ate before boarding my plane. In New York, I similarly had to trust everyone at LaGuardia Airport, my New York taxi driver, and the staff at my new hotel -- where I am right now, writing this. If I had to count, I'd guess I easily had to trust a hundred thousand people -- and that was all before 10:30 this morning. Humans are a trusting species. There were 120 people on my plane, almost all of them strangers to each other, and at no point did anyone jump up and attack the person sitting next to them. It's absurd for me to even say it, but if we had been a planeload of chimpanzees, that would have been impossible. Trust is essential for society to function -- our civilization would collapse completely without it -- and the fact that we don't think about it is a measure of how well that trust works. 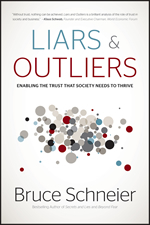 Liars and Outliers is a book about trust and society. It's a way of thinking about society, and it's a way of conceptualizing society's problems. It's not a book about why trust is important; lots of people write about that. It's a book about how we induce trust: about how security enables trust. There were a lot of complicated mechanisms in play this morning to ensure that no one mugged me on the street, my taxi driver didn't rob me on the way to the airport, and the plane was staffed with a competent pilot. Liars and Outliers is a book about those mechanisms. Trust is a complicated concept, and the word is overloaded with many meanings. There's a personal and intimate type of trust. When I say that I trust a friend, or a spouse, I'm talking less about their specific actions and more about them as a person. I have a general reliance that they will behave in a trustworthy manner. In other words, I know their intentions and I trust their actions will be informed by those intentions. There's also a less intimate, less personal form of trust. When I got into the taxicab this morning, I didn't know the driver's intentions. For all I knew, he could have been a bank robber by night. But I did trust that, for the specific interaction of taxi driver and passenger, he would behave in a trustworthy manner. And he trusted me to do the same. This is a much more limited form of trust. Maybe it's more "confidence" than trust, and maybe the driver's actions are more like "compliance" than trustworthiness, but it's the type of trust that makes society function. I like to call this sort of trust "cooperation." "All complex ecosystems require cooperation. This is true for biological ecosystems, social systems, and sociotechnical systems. Also, in any cooperative system, there also exists an alternative parasitical strategy... These parasites can only survive if they're not too successful. That is, if their number gets too large or too powerful, the underlying system collapses..."
Here's how I like to look at it. All complex ecosystems require cooperation. This is true for biological ecosystems, social systems, and sociotechnical systems. Also, in any cooperative system, there also exists an alternative parasitical strategy. Examples include tapeworms in your digestive tract, thieves in a market, spammers on e-mail, and people who refuse to pay their taxes. These parasites can only survive if they're not too successful. That is, if their number gets too large or too powerful, the underlying system collapses. If there are too many tapeworms in your digestive tract, you die and then they die. Too many thieves in a market, and no one visits the market anymore and the thieves starve. Too many people stop paying their taxes, and you get Greece. This means there is a fundamental tension between cooperation and what I call defection. (Students of game theory will immediately recognize these terms.) It's a tension between us as individuals and us collectively as society. We might individually want each other's stuff, but we're all better off living in a theft-free society. We might individually not want to pay our taxes, but we're all better off if everyone does. And so on. More to the point, we're individually better off if everyone cooperates except us. If I can both 1) live in a theft-free society, and 2) steal your stuff, I personally have the best of both worlds. But if everyone acts that way, society collapses. Most of us recognize this: that it's not in our long-term best interest to act in our short-term self-interest. But not everyone does. That's why we need mechanisms to induce trust. That's why we need security. And that's what Liars and Outliers is about. Bruce Schneier is an internationally renowned security technologist, called a "security guru" by The Economist. 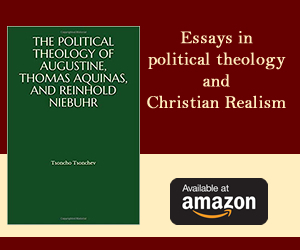 He is the author of 12 books -- including his latest best-seller Liars and Outliers: Enabling the Trust Society Needs to Survive -- as well as hundreds of articles and essays, and many more academic papers. His influential newsletter Crypto-Gram and his blog Schneier on Security are read by over 250,000 people. He has testified before Congress, is a frequent guest on television and radio, served on several government technical committees, and is regularly quoted in the press. Schneier is the Chief Security Technology Officer of BT.